Posted 4:25 pm by nocopf-admin & filed under News, Youth. Posted 10:35 pm by nocopf-admin & filed under News, Youth. Posted 5:10 pm by nocopf-admin & filed under News. Posted 4:32 pm by nocopf-admin & filed under News. An introduction to pheasant habitat basics. Posted 2:57 pm by nocopf-admin & filed under News. Posted 11:02 pm by nocopf-admin & filed under News. Posted 2:01 pm by nocopf-admin & filed under News. The 2015 Small Game Walk-In Atlas Brochure is now available from the Colorado Parks & Wildlife. Go to the Colorado Parks & Wildlife website directly to download your copy. Posted 1:54 pm by nocopf-admin & filed under News. 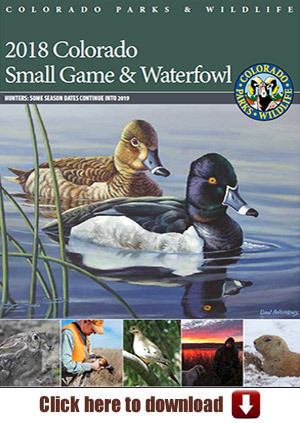 The 2015 Small Game Brochure from Colorado Parks and Wildlife is now available. Click here to download your copy, or go to the Colorado Parks and Wildlife website directly. Posted 1:43 pm by nocopf-admin & filed under Habitat, News. Posted 1:41 pm by nocopf-admin & filed under News.